Starting in the third century BC, the name Calabria was originally given to the Adriatic coast of the Salento peninsula in modern Apulia. In the late first century BC this name came to extend to the entirety of the Salento, when the Roman emperor Augustus divided Italy into regions. The whole region of Apulia received the name Regio II Apulia et Calabria. By this time modern Calabria was still known as Bruttium, after the Bruttians who inhabited the region. Later in the seventh century AD, the Byzantine Empire created the Duchy of Calabria from the Salento and the Ionian part of Bruttium. Even though the Calabrian part of the duchy was conquered by the Longobards during the eighth and ninth centuries AD, the Byzantines continued to use the name Calabria for their remaining territory in Bruttium. The modern name Italy derives from Italia, which was first used as a name for the southern part of modern Calabria. Over time the Greeks started to use it for the rest of the southern Italian peninsula as well. After the Roman conquest of the region, the name was used for the entire Italian peninsula and eventually the Alpine region too. 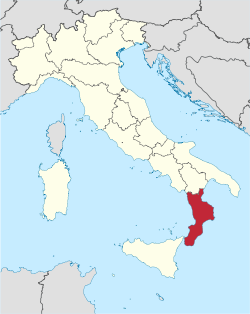 The region is generally known as the “toe” of the “boot” of Italy and is a long and narrow peninsula which stretches from north to south for 248 km (154 mi), with a maximum width of 110 km (68 mi). Some 42% of Calabria's area, corresponding to 15,080 km2, is mountainous, 49% is hilly, while plains occupy only 9% of the region's territory. It is surrounded by the Ionian and Tyrrhenian seas. 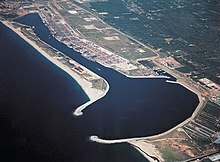 It is separated from Sicily by the Strait of Messina, where the narrowest point between Capo Peloro in Sicily and Punta Pezzo in Calabria is only 3.2 km (2 mi). Three mountain ranges are present: Pollino, La Sila and Aspromonte. All three mountain ranges are unique with their own flora and fauna. The Pollino Mountains in the north of the region are rugged and form a natural barrier separating Calabria from the rest of Italy. Parts of the area are heavily wooded, while others are vast, wind-swept plateaus with little vegetation. These mountains are home to a rare Bosnian Pine variety and are included in the Pollino National Park. The Pollino National Park also has the distinction of being the largest national park in Italy and covers about 1,925.65 square kilometres. Below are the two extremes of climate present in Calabria, both the warm mediterranean subtype on the coastline and the highland climate of Monte Scuro. The region is seismically active and is generally ascribed to the re-establishment of an equilibrium after the latest (mid-Pleistocene) deformation phase. Some authors believe that the subduction process is still ongoing, which is a matter of debate (van Dijk & Scheepers, 1995). Around 1500 BC a tribe called the Oenotri ("vine-cultivators"), settled in the region. According to Greek mythology they were Greeks who were led to the region by their king, Oenotrus. The Greeks used the term 'italoi', which according to some ancient Greek writers was derived from a legendary king of the Oenotri, Italus and according to others from the bull. Originally the Greeks used 'italoi' to indicate Calabrians and later it became synonymous with the rest of the peninsula. Calabria therefore was the first region to be called Italia (Italy). After sacking Rome in 410, Alaric I (King of the Visigoths) went to Calabria with the intention of sailing to Africa. He contracted malaria and died in Cosentia (Cosenza), probably of fever. Legend has it that he along with the treasure of Rome were buried under the bed of the River Busento. With the fall of the western part of the Roman Empire in 476, Italy was taken over by the Germanic chieftain Odoacer and later became part of the Ostrogothic Kingdom in 489. The Ostrogothic kings ruled officially as Magistri Militum of the Byzantine Emperors and all government and administratine positions were held by the Romans while all primary laws were legislated by the Byzantine Emperor. Therefore, during the sixth century, under the Ostrogoths' rule, Romans could still be at the center of government and cultural life, such as the native Roman Cassiodorus who, like Boethius and Symmachus, emerged as one of the most prominent Roman men of his time. He was an administrator, politician, scholar and historian who was born in Scylletium (near Catanzaro). He spent most of his career trying to bridge the divides of East and West, Greek and Latin cultures, Romans and Goths, and official Christianity and Arian Christianity, which was the form of Christianity of the Ostrogoths and which had earlier been banned. He set up his Vivarium monastery (monastery school) in Scylletium. He oversaw the collation of three editions of the Bible in Latin. Seeing the practicality of uniting all the books of the Bible in one volume, he was the first who produced Latin Bibles in single volumes. The most well-known of them was the Codex Grandior which was the ancestor of all modern western Bibles. Byzantine (Eastern Roman) emperor Justinian I, retook Italy from the Ostrogoths between 535 and 556. They soon lost much of Italy to the Lombards between 568 and 590, but they retained the south for 1/2 a millinium until 1059/1071, where they thrived and where the Greek language was the official and vernacular language. In Calabria and towns such as Stilo and Rossano achieved great religious status. From the 7th Century many monasteries were built in the Amendolea and Stilaro Valleys and Stilo was the destination of hermits and Basilian monks. 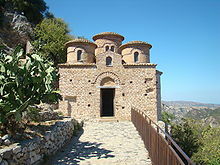 Many Byzantine churches are still seen in the region. The 10th-century church in Rossano is considered one of the best preserved Byzantine churches in Italy. It was built by St. Nilus the Younger as a retreat for the monks who lived in the tufa grottos underneath. The present name of Calabria comes from the duchy of Calabria. Around the year 800, Saracens began invading the shores of Calabria, attempting to wrest control of the area from the Byzantines. This group of Arabs had already been successful in Sicily and knew that Calabria was another key spot. The people of Calabria retreated into the mountains for safety. Although the Arabs never really got a stronghold on the whole of Calabria, they did control some villages while enhancing trade relations with the eastern world. In 918, Saracens captured Reggio (which was renamed Rivà) and sold the majority of its population in the slave markets of Sicily and North Africa. It is during this time of Arab invasions that many staples of today's Calabrian cuisine came into fashion: citrus fruits and eggplants for example. Exotic spices such as cloves and nutmeg were also introduced. In the 1060s the Normans from their duchy in France, under the leadership of Robert Guiscard's brother, Roger I of Sicily, established a presence in this borderland, and organized a government modeled on the Eastern Roman Empire and was run by the local magnates of Calabria. Of note is that the Normans established their presence here, in southern Italy (namely Calabria), 6 years prior to their conquest of England, (see The Battle of Hastings). The purpose of this strategic presence in Calabria was to lay the foundations for the Crusades 30 years later, and for the creation of two Kingdoms: the Kingship of Jerusalem, and the Kingdom of Sicily. Ships would sail from Calabria to the Holy Land. This made Calabria one of the richest regions in Europe as princes from the noble families of England, France and other regions, constructed secondary residences and palaces here, on their way to the Holy Land. Guiscard's son Bohemond, who was born in San Marco Argentano, would be one of the leaders in the first crusade. In 1442 the Aragonese took control under Alfonso V of Aragon who became ruler under the Crown of Aragon. In 1501 Calabria came under the control of Ferdinand II of Aragon who is famed for sponsoring the first voyage of Christopher Columbus in 1492. Calabria suffered greatly under Aragonese rule with heavy taxes, feuding landlords, starvation and sickness. After a brief period in the early 1700s under the Austrian Hapsburgs, Calabria came into the control of the Bourbons in 1735. It was during the 16th century that Calabria would contribute to modern world history with the creation of the Gregorian calendar by the Calabrian doctor and astronomer Luigi Lilio. Calabria enjoys a diversified economy comparable to western nations in various categories, as shown in these statistics: the Gross Domestic Product (GDP) of Calabria is subdivided as follows: service industry (28.94%), financial activities and real estate (21.09%), trade, tourism, transportation and communication (19.39%), taxation (11.49%), manufacturing (8.77%), construction (6.19%) and agriculture (4.13%). It is one of the least (resort) developed regions in Italy. Its economy is hampered by corruption, tax evasion and organized crime which is mainly run by the 'Ndrangheta (the local Mafia syndicate); the latter has deep connections with some of the local authorities. Calabria attracts year-round tourism, offering both summer and winter activities, in addition to its cultural, historical, artistic heritage, it has an abundance of protected natural habitats and 'green' zones. The 485 miles (781 kilometres) of its coast make Calabria a tourist destination during the summer. The low industrial development and the lack of major cities in much of its territory have allowed the maintenance of indigenous marine life. In addition to the coastal tourist destinations, the interior of Calabria is rich in history, traditions, art and culture. Cosenza is among the most important cultural cities of Calabria, with a rich historical and artistic patrimony. Medieval castles, towers, churches, monasteries and other French castles and structures from the Norman to the Aragonese periods are common elements in both the interior and coastline of Calabria. A typical feature is agricultural richness in Calabria. The region boasts the second highest number of organic farmers only after Sicily. The olive tree, representing 29.6% of UAA and represents approximately 70% of tree crops. The region is the second-highest for olive oil production  with Carolea, Ogliarola, and Saracena olive cultivars as the main regional varieties. The Bergamot orange is intensively cultivated, since the 18th century, exclusively in coastal area nearby to Reggio, where it found its optimal geological and weather conditions: essence oil from Calabrian Bergamot reach the best quality in the world. Calabria is also the largest producer of Porcini Mushrooms in Italy. The unemployment rate stood at 21.6% in 2017 and was the highest in Italy and one of the highest inside the European Union. Reggio Calabria is on the strait between the mainland and Sicily, the largest and oldest city in Calabria dating from the 8th century BC, known for its panoramic seaside with botanical gardens between the art nouveau buildings and the beaches, and its 3,000 years of history with its Aragonese Castle and the Museo Nazionale della Magna Grecia where the Riace bronzes (Bronzi di Riace) are located. Cosenza, birthplace of scientist and philosopher Bernardino Telesio and seat of the Cosentian Academy, known for its cultural institutions, the old quarter, a Hohenstaufen Castle, an open-air museum and an 11th-century Romanesque-Gothic Cathedral. On 12 October 2011, the Cathedral of Cosenza received UNESCO World Heritage status for being "Heritage Witness to a Culture of Peace". This is the first award given by UNESCO to the region of Calabria. Capo Vaticano, on the Tyrrhenian Sea, is a wide bathing place near Tropea. Gerace, near Locri, is a medieval city with a Norman Castle and Norman Cathedral. Stilo, the birthplace of philosopher Tommaso Campanella, with its Norman Castle and Byzantine church, the Cattolica. Badolato near Soverato is a well-preserved medieval hilltop village with 13 churches. It was selected as one of the 1000 marvels of Italy to mark the anniversary of the unification of Italy. It is popular with wealthy foreigners who have renovated the old houses. Nicotera on the Tyrrhenian Sea, is a small medieval town with an ancient Ruffo's castle. Spilinga is known for its spicy pork pate, 'Nduja. ^ "Eurostat – Tables, Graphs and Maps Interface (TGM) table". Epp.eurostat.ec.europa.eu. 26 February 2013. Retrieved 26 March 2013. ^ "European Commission – PRESS RELEASES – Press release – Regional GDP per inhabitant in 2008 GDP per inhabitant ranged from 28% of the EU27 average in Severozapaden in Bulgaria to 343% in Inner London". europa.eu. Archived from the original on 12 February 2012. Retrieved 24 October 2015. ^ Lewis and Short Latin Dictionary, entry "Calabria". ^ Carpenter, T. H.; Lynch, K. M.; Robinson, E. G. D., eds. (2014). The Italic People of Ancient Apulia: New Evidence from Pottery for Workshops, Markets, and Customs. New York City, New York: Cambridge University Press. pp. 38–39. ISBN 9781139992701. ^ Colafemmina, Cesare (2012). The Jews in Calabria. Leiden, The Netherlands: Brill. p. 1. ISBN 9789004234123. ^ Dionysius of Halicarnassus (1937). "1.35". Roman Antiquities. Harvard University Press. ^ Strabo (1924). "6.1.4". In Jones, H. L. (ed.). Geography. 3. Cambridge, Massachusetts: Harvard University Press. ISBN 978-0-674-99201-6. ^ Pallottino, Missimo (2014). A History of Earliest Italy. New York City, New York: Routledge. p. 50. ISBN 9781317696827. ^ NASA – Clouds and Sunlight. Nasa.gov (2009-12-30). Retrieved on 2013-07-28. ^ "Journeys – Praia Art Resort". 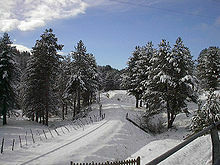 ^ "The Calabria National Park, sila Grande and Sila Piccola". ^ "attivita_montagna – Costa Tiziana". Archived from the original on 20 December 2016. Retrieved 28 November 2018. ^ "Discoveries in Sicily and Calabria: The giants of the sila". ^ "The Giants of the Sila: memories and history of a biogenetic reserve – I Giganti della Sila". Archived from the original on 21 December 2016. Retrieved 21 December 2018. ^ "The Forest of Giants". ^ Rai. "Water, woodland, silence: the Sila Park" – via YouTube. ^ "Calabria climate: when to go to Calabria – Italy: travel, recipes, family and health". 17 March 2016. ^ "Reggio Calabria (RC) 21 m. s.l.m. (a.s.l.)" (PDF). Servizio Meteorologico. Retrieved 7 September 2013. ^ "Climate Normals for Monte Scurto (Italian IP required)" (PDF). Servizio Meteorologico. Retrieved 24 September 2018. ^ a b c d e f van Dijk, J.P., Bello, M., Brancaleoni, G.P., Cantarella, G., Costa, V., Frixa, A., Golfetto, F., Merlini, S., Riva, M., Toricelli, S., Toscano, C., and Zerilli, A. (2000, a); A new structural model for the northern sector of the Calabrian Arc. Tectonophysics, 324, 267–320. ^ Argand, E. (1922); La tectonique de l'Asie. Comptes Rendus 3rd Int. Geol. Congr., Liège (Be), 1922, 1, 171–372. ^ Boccaletti, M., and Guazzone, G. (1972, b); Evoluzione paleogeografica e geodinamica del Mediterraneo: i bacini marginali. Mem. Soc. geol. It., 13, 162–169. ^ a b Ogniben, Leo (1973); Schema geologico della Calabria in base ai dati odierni. Geol. Romana, 12, 243–585. ^ Cortese, E. (1895); Descrizione geologica della Calabria. Mem. Descrit. Carta Geol. It., 9, 310 pp., Roma. ^ Limanowski, Miesislas (1913); Die grosse kalabrische Decke. Bull. Int. Acad. Sc. Cracovie, Cl. Sc. Math. Nat., S.A., (6A), 370–385. ^ Quitzov, H.W. (1935); Der Deckenbau des Kalabrischen Massivs und seine Randgebiete. Abh. d. Ges. d. Wiss. zu Gottingen, Mat. Phys. Kl., 3e Folge, H. 13, 63–197. ^ Caire, André, Glangeaud, L., and Grandjaquet, C. (1960); Les grand traits structureaux et l'évolution de territoire calabro-sicilien (Italie méridionale). Bull. Soc. Geol. Fr., ser. 7, v. 2, 915–938. ^ Caire, André (1961); Remarques sur l'evolution tectonique de la Sicile. Bull. Soc. Geol. Fr., 7 (3), 545–558. ^ Grandjacquet, C., Glangeaud, L., Dubois, R., and Caire, A. (1961); Hypothèse sur la structure profonde de la Calabre (Italie). Rev. Geogr. Phys. Geol. Dyn., 4 (3), 131–147. ^ Ogniben, L. (1969, a); Schema introduttivo alla geologia del confine calabro-lucano. Mem. Soc. Geol. Ital., 8, 453–763. ^ Caire, André (1970, a); Sicily in its Mediterranean setting. 145–170. ^ Caire, André (1975, a); Italy in its Mediterranean setting. In: Squyres, C.H. (Ed). Geology of Italy, Earth Sci. Soc. Lib. Arab. Rep., 11–74, Tripoli. ^ Caire, André (1978); The Central Mediterranean mountain chains in the Alpine orogenic environment. ^ Burton, A.N. (1971); Carta Geologica della Calabria alla scala di 1:25.000, Relazione generale. Cassa per il Mezzogiorno, Servizio Bonifiche, Roma (It. ), I.G.M. Firenze, 120 pp., 1971, 120 pp. ^ Amodio-Morelli, L., Bonardi, G., Colonna, V., Dietrich, D., Giunta, G., Ippolito, F., Liguori, V., Lorenzoni, S., Paglionico, A., Perrone, V., Piccaretta, G., Russo, M., Scandone, P., Zanettin Lorenzoni, E., and Zuppetta, A. (1976); L'Arco calabro-peloritano nell'orogene appenninico-maghrebide. Mem. Soc. Geol. Ital., 17, 1–60. ^ Dubois, Roland (1976); La suture calabro-apenninique Cretacee-Eocene et l'ouverture Tyrrhenienne neogene: etude petrographique et structurale de la Calabre centrale. These, Univ. de Paris, 1976, 567 pp. ^ Grandjacquet, C., and Mascle, G. (1978); The structure of the Ionian sea, Sicily and Calabria-Lucania. In: Nairn, A.E.M., H. Kanes and F.G. Stehli (Eds). The ocean basins and margins, Plenum Press, 5, 257–329, New York. ^ Moussat, E. (1983, Int. Rept. ); Evolution de la mer Tyrrhenienne centrale et ses marges septentrionales en relation avec la néotectonique dans l'Arc calabrais. These 3e cycle, Univ. Pierre et M. Curie, Paris (Fr. ), 122 pp. ^ van Dijk, J.P., and Scheepers, P.J.J. (1995); Neogene rotations in the Calabrian Arc. Implications for a Pliocene-Recent geodynamic scenario for the Central Mediterranean. Earth Sci. Rev., 39, 207–246. ^ CARSON, L. PIERCE. "Eating like a Calabrese — New cookbook offers culinary gems from Italy's 'toe'". ^ Vista, Vino Con (12 April 2011). "Vino Con Vista – The Blog: Calabria For Tourists – 5 Things You Must See and Do". ^ generator, metatags. "History of Calabria – Bleeding Espresso". ^ "Storia della Calabria – Calabrian History". ^ a b c d generator, metatags. "History of Calabria – Bleeding Espresso". ^ Antonio Luce (25 January 2011). "italian travel team Calabria – Italy Travel Guide" – via YouTube. ^ Inc., Dante Alighieri Society of Massachusetts,. "Dante Alighieri Society of Massachusetts: A Concise History of Italy". ^ "Cirò: Calabria's Ancient Wine from the Toe of Southern Italy's Boot – Into Wine". ^ Coulter, Cornelia C. (1 January 1942). "Review of Calabria: The First Italy". Classical Philology. 37 (2): 223–225. JSTOR 264353. 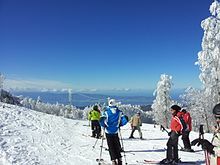 ^ "Olympic Games – Winter Summer Past and Future Olympics". ^ "Intellectual Property (Stanford Encyclopedia of Philosophy)". plato.stanford.edu. Retrieved 24 October 2015. ^ "Calabria | ArtisanVineyards.com". artisanvineyards.com. Archived from the original on 6 November 2015. Retrieved 24 October 2015. ^ "WineCountry.it – region and wines of Calabria Italy". web.archive.org. Archived from the original on 31 March 2004. Retrieved 24 October 2015. ^ Matthews, Jeff. "Who were the Sybarites?". Archived from the original on 6 March 2016. Retrieved 6 March 2016. ^ "Locri Reggio Calabria and Aspromonte Calabria – Amalfi Coast". ^ Simcox, Edith Jemima (4 November 2010). Primitive Civilizations: Or, Outlines of the History of Ownership in Archaic Communities. Cambridge University Press. ISBN 978-1-108-02184-5. ^ Bernardini, Paolo; Camporeale, Giovannangelo (1 January 2004). The Etruscans Outside Etruria. Getty Publications. ISBN 978-0-89236-767-2. ^ Peter Brown, The World of Late Antiquity: AD 150–750. ^ TheGreatMysteries (3 April 2011). "Testament The Bible And History episode 6 Power And Glory part one (1 of 2)" – via YouTube. ^ "The Scriptorium and Library at the Vivarium (Circa 560) : HistoryofInformation.com". ^ a b "Cassiodorus, Chapter 6: Vivarium". ^ metatags generator. "Bleeding Espresso". bleedingespresso.com. Retrieved 24 October 2015. ^ The Italian Cities and the Arabs before 1095, Hilmar C. Krueger, A History of the Crusades: The First Hundred Years, Vol. I, ed. Kenneth Meyer Setton, Marshall W. Baldwin, (University of Pennsylvania Press, 1955), 50–51. ^ Matthews, Jeff. "Luigi Lillo, the Gregorian Calendat & the Carafa Castle". Archived from the original on 1 April 2016. Retrieved 6 March 2016. ^ org.cambridge.ebooks.online.book.Author@26275d6b; org.cambridge.ebooks.online.book.Author@4e735990 (1 January 2011). "A 'Short Treatise' on the Wealth and Poverty of Nations (1613)". doi:10.7135/UPO9781843317708. ISBN 978-1-84331-770-8. ^ "Golden Day 107: Cosenza with LuLu Bianco of Calabrisella Mia". 28 April 2014. ^ "In Italy, Calabria is drained by corruption". New York Times. Retrieved 28 May 2017. ^ a b "Portraits of the Regions". DG REGIO of the European Commission. March 2004. Archived from the original on 21 July 2011. Retrieved 8 September 2010. ^ "Biologico, l'Italia resta prima in Europa – AgroNotizie – Economia e politica". agronotizie.imagelinenetwork.com. Retrieved 24 October 2015. ^ Bolani, Domenico Spano (1857). Storia di Reggio di Calabria da'tempi primitivi sino all'anno di Cristo 1797. p. 297. ^ "Calabria itineraries from the Tyrrhenian to the Ionian". ^ "World Port Rankings 2005". American Association of Port Authorities. May 2007. Archived from the original on 27 September 2007. Retrieved 6 February 2008. ^ Van Marle, Gavin (31 January 2008). "Europe Terminals stretched to limit". Lloyds List Daily Commercial News. pp. 8–9. ^ "Statistiche demografiche ISTAT". demo.istat.it. Retrieved 24 October 2015. ^ "Sister and Friendship Cities". Burwood Council. 17 August 2012. Archived from the original on 27 March 2014. Retrieved 9 March 2015. ^ "Patto d'amicizia tra la Calabria ed il West Virginia" (PDF). ^ "Guide to Reggio Calabria". Delicious Italy. 8 May 2012. Retrieved 26 March 2013. 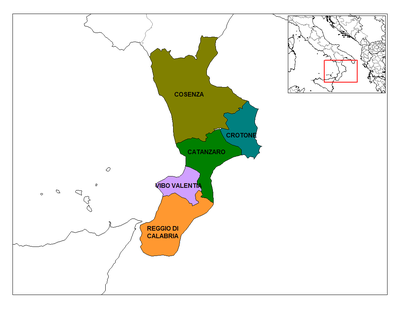 ^ "Regions -> Calabria". Insiders Abroad. Retrieved 26 March 2013. ^ "Youritaly.com | Cosenza City | Calabria". web.archive.org. Archived from the original on 22 February 2014. Retrieved 24 October 2015. ^ "Cosenza – Calabria: Your holiday in Italy". en.italy-holiday.com. Retrieved 24 October 2015. ^ "Secret Jews Evangelical Christians – Rabbi Barbara". ^ "Orthodox Europe :: Italy". ^ "Orthodox Christianity in Southern Italy. Part 1 / OrthoChristian.Com". ^ "Center for the Study of Jewry in Calabria and Sicily". Archived from the original on 12 June 2010. Retrieved 11 September 2010. ^ "Pausanias, Description of Greece, Arcadia, 8.3.5, at Theoi Project". theoi.com. Retrieved 24 October 2015. ^ "Sfalassa Bridge". HighestBridges.com. 28 March 2010. Retrieved 26 March 2013.